I have not been able to blog hop lately, quite frankly I miss seeing everyone's creativity. I am looking forward to this coming long weekend. I took an extra couple of days off around Canada Day to give myself a little mini vacation. I was disappointed with a mistake I made on this card, my son said it was not noticable and with the ribbon binding I am hoping that is true. I had to once again turn to clipart for this one, the nice stamps I have with wine on them are larger. After I took the picture I felt that it needed a little something extra, so I added a thin stamped border that finished it off, I had already handed it over before I realized I had not taken a picture of the finished item. Supplies: Designer Paper-Close to my Heart-Veranda, Stampin’ Up!-Naturals White cardstock, misc clipart, Close to my Heart-Summer Harvest, Making Memories-square eyelet. The dog's name is Buddy :) and he likes to hunt small critters and bring them in the house as gifts. Thank goodness it is Friday, I am almost ready to start counting down the days till summer vacation. I have my fingers crossed though it is lotto Max draw date. 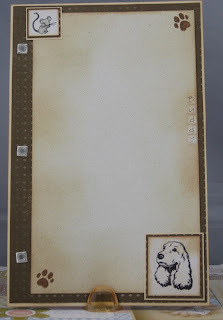 Supplies: Designer Paper-Close to my Heart –Veranda, Stampin’ Up!-Naturals White cardstock, Spaniel and mouse clipart, Inkadinkado- Dog Paw, Making Memories-square eyelet. I don't know a whole lot about card games, even less about Bridge and I certainly hope that the quote I found makes sense to someone who plays and loves the game. I used misc clipart for the cards, which are dual layered and popped up with foam tape, I used a border stamp to add something extra along with misc gems. Supplies: Designer Paper-Close to my Heart –Veranda, Stampin’ Up!-Naturals White cardstock, Perfectly Clear Stamps-Posie Swirls, misc gems, misc clipart, Scotch mounting tape, Making Memories-square eyelet. I had a request to create a couple more 'pages' for the card on Friday, the signatures had already filled the orginal set. This theme is a tea and a good book. I used an excerpt from the Hitchhikers Guide to the Galaxy as a background image. The book, book mark are clipart. I would have like to spell out a good book but I ran out of o's :). 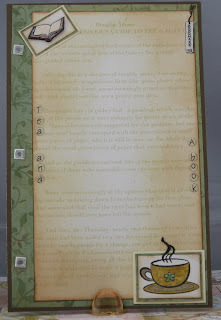 Supplies: Designer Paper-Close to my Heart –Veranda, Stampin’ Up!-Naturals White cardstock, TPC Studio clear stamps-Coffee Cafe, misc clipart, Craft Essentials Alphabet stickers, Making Memories-square eyelet. I am soo happy it is Friday, the older I get the more I look forward to weekends :). 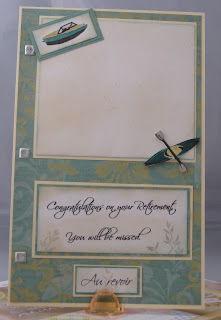 This is the final 'page' in the card, although there is a back to it. I needed to utilize clipart for this section, I colored the boat and kayak with my spica glitter markers to help them stand out. The paddles on the kayak are cut out and popped up with foam tape. Supplies: Designer Paper-Close to my Heart –Veranda, Stampin’ Up!-Naturals White cardstock, Memory Box- Leafy Branch, Comotion Rubber Stamps-Leaf Spray, misc watersport clipart, Scriptina Pro font, Making Memories-square eyelet. I am not much of a shopper when it comes to fashion or really any thing other then food and essentials, I ended up finding some basic clipart for this 'page' and coating it with Crystal Dimensions then coating it with a pretty shimmery micro fine glitter. I then edged each piece (shoe, dress and purse) with black marker. I used Craft Essentials Alphabet stickers to spell out Shopping. Supplies: Designer Paper-Close to my Heart –Veranda, Stampin’ Up!-Naturals White cardstock, Misc clipart, Craft Essentials Alphabet stickers, Jewel Glitter Ritz-Green Mist glitter, Making Memories-square eyelet. Whew.. I can't believe that it is Sunday evening already. I am not ready for a new week yet :). Not much in the way of carding this weekend, so I am still going to ride the coat tails of the big project from last weekend. 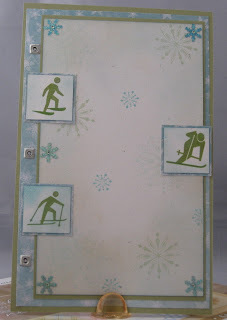 This is 'page' number three, theme-winter sports. I don't have any stamps for this, I wish I did but I used misc clipart instead. My son broke his arm... again this is the second time for his right arm. He did a good number on it this time though. We have our fingers crossed that he gets his a regular cast on tomorrow, with out any pins in his arm. The break is nasty and we have to go for round number 4 on the x-rays to make sure nothing has shifted and is requiring pins to hold it in place, at a minimum he will have a cast up past his elbow. Lovely for summer. Supplies: Designer Paper-Close to my Heart –Veranda, Bo Bunny-Jack Frost Crystals, Stampin’ Up!-Naturals White cardstock, and Snow Swirls stamps, misc gems, Scriptina Pro font, Making Memories-square eyelet, misc clipart, misc snowflake embellishment. This is the back side of 'page' two, the helmet is popped up with foam tape and cut out for a 2-d effect. I hesitated at putting to much detail on each of these for durability. I was not sure how the card would hold up if it was passed around. I used Spica glitter markers to match the color of the helmet and the bike to the background. Supplies: Designer Paper-Close to my Heart –Veranda, Stampin’ Up!-Naturals White cardstock, Microsoft Work clipart, GStudio misc flower stamp, misc gems. 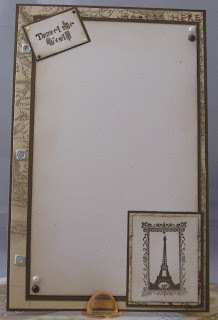 This is the front side of 'page' number two, travel being the theme. This was the only Designer paper that was not Close to my heart. 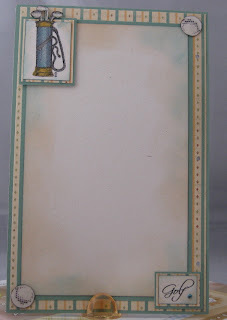 Supplies:Designer Paper-Close to my Heart –Veranda,Gartner-Bon Voyage Collection, Stampin’ Up!-Naturals White cardstock, TPC Studio-Travel World clear stamps, Misc pearls, Making Memories-square eyelet. This is the backside of the cover or 'page' number two in the card book. I used Diamond Glaze on the golf balls to give them a glossy look. I cut the edge at the top of the golf clubs to have them over hang then used mounting tape to hold them in place. I used Spica glitter markers and ink to color the bag. 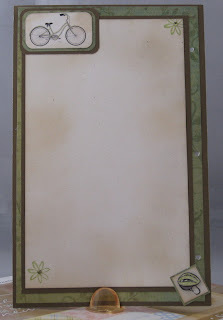 Supplies: Designer Paper-Close to my Heart –Veranda, Stampin’ Up!-Naturals White cardstock, Microsoft Word- misc Golf clipart, misc gems, Scriptina Pro font, Making Memories-square eyelet. I had no lack of craft time this weekend, in fact I think I spent more time this weekend making cards then I have in the past two months. 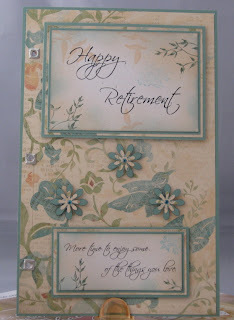 I was asked to make a retirement card for my boss who is retiring in July. I was quite flattered but in the very same breath a little wide eyed. It was quite the task to say the least. I ended up going with a card book idea, the card would need room for close to if not more than 100 well wishes. 15hrs later this is the first page, no it did not take 15 or so hrs for the first page but I am only going to show the first page. I figure that much time I would spread it out a little then show the end product. 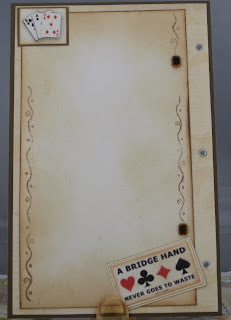 The card is made up of 4 double-sides 'pages'. Too try to blend all the pages in I tried to use a paper pack I had from Close to my heart - Veranda. The idea for the card was 'more time to do some of the things she loves'. Golf, travel, shopping, winter sports, and boating. 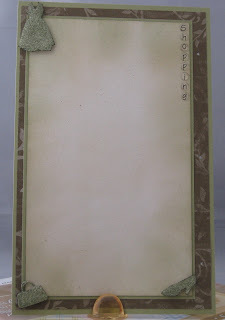 Supplies: Designer Paper-Close to my Heart –Veranda, Stampin’ Up!-Naturals White cardstock, Memory Box- Leafy Branch, Comotion Rubber Stamps-Leaf Spray, flower punch, misc gems, Scriptina Pro font, Making Memories-square eyelet. 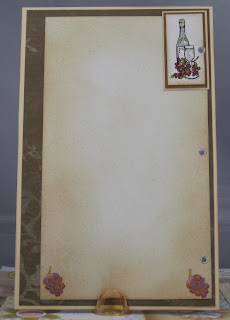 Besides this rather large project, I also managed to attend a Stampin' Up! workshop. I figured I could use a follow-me card experience I plum wore my creativity out. I guess it runs through the blood of a teen to want to play music. This is a birthday card for someone who is talented with multiple musical instruments. 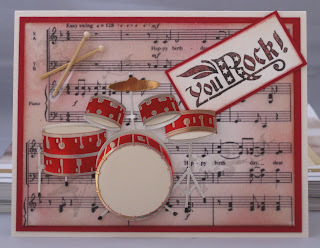 The focal point for this card is the drums, I incorporated guitar from the Inhkadinkado Rock Star stamp set on the inside of the card with a guitar along the inner seam also with in red/black shades. I used a Happy Birthday music sheet I found on the internet then sponged ink on the printed image. I stamped random images from the Inkadinkado Rock Star stamp set in light grey on the image to give it a bit of a distressed look. This was a card request from a friend, the lighting was not the best when I took this picture so some of the fine details are not as well defined as I would have liked. Supplies: Cream and red cardstock, Inkadinkado-Rock Star, Jolee’s Boutique-Percussion, misc sheet music.